(CN) – Researchers have discovered the fossils of two new species of ancient saber-toothed predators that will help illuminate a key period in the early evolution of mammals. The lineage of modern mammals can be traced back to a group of animals called therapsids, a diverse group of “protomammals” that dominated terrestrial ecosystems during the Permian period approximately 299 to 252 million years ago — millions of years before dinosaurs first roamed the planet. A pair of studies published Friday in the journal PeerJ describe two previously unknown species of predatory protomammals. Discovered near the town of Kotelnich along the Vyatka River in Russia, the fossils add to the Vyatka Paleontological Museum’s collection of well-preserved Permian fossils. As the majority of Permian fossils have been discovered in South Africa’s Karoo Basin, the newly described remains help balance out the outsized role the African nation’s record serves in informing researchers’ understanding of protomammal evolution. The menacing new species are named after a pair of legendary monsters from Russian folklore. Gorynychus masyutinae, a wolf-sized carnivore, represents the largest predator in the Kotelnich fauna – all of the animals in the Russian river town. It is named after Zmey Gorynych, a three-headed dragon. The second species, Nochnitsa geminidens, a long-snouted carnivore with needle-like teeth, is named after a malicious nocturnal sprite. The smaller Nochnitsa, on the other hand, belongs to a subgroup called gorgonopsians, or “gorgon faces.” The researchers believe that given its fairly large eye sockets, it is likely that the species and its kin were nocturnal. The species aid scientists’ understanding of ecosystem reorganization following the mid-Permian extinction 260 million years ago. While not as well-known as the subsequent and more devastating end-Permian mass extinction 8 million years later – which nearly led to the extinction of protomammals – the earlier event served a key role in guiding the course of protomammal evolution. 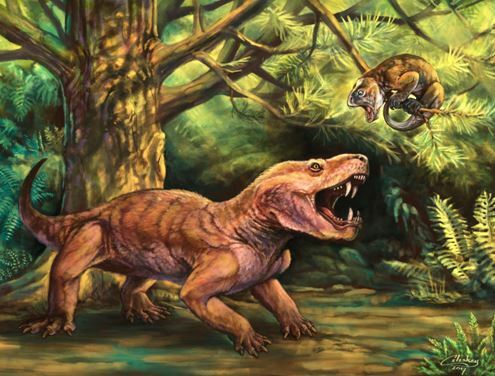 Saber-toothed gorgonopsians – which were the size of tigers – were the top predators in typical late-Permian ecosystems, while therocephalians were typically small insectivores. However, these roles were reversed in mid-Permian ecosystems. At Kotelnich, the saber-toothed Gorynychus was a therocephalian and gorgonopsians were much smaller. “In between these extinctions, there was a complete flip-flop in what roles these carnivores were playing in their ecosystems — as if bears suddenly became weasel-sized and weasels became bear-sized in their place,” said Christian Kammerer, a researcher at the North Carolina Museum of Natural Sciences. The new species offer the first evidence of a worldwide turnover in predators following the mid-Permian extinction, opposed to just a localized turnover in South Africa. “Kotelnich is one of the most important localities worldwide for finding therapsid fossils — not only because they are amazingly complete and well-preserved there, but also because they provide an all-too-rare window into mammal ancestry in the Northern Hemisphere during the Permian,” Kammerer said.